The soil in Phoenix Arizona is composed mainly of clay and has large deposits of calcium carbonate, making it very alkaline. The calcium carbonate also tends to forms in layers of concrete hard caliche which can make it nearly impossible to hand dig a hole in some locations. A jackhammer is the tool of choice in these sitiuations. There is sufficient iron in the lower desert soil but it is often chemically unavailable to plants because of the high alkalinity. The water here is also fairly alkaline and salty this compounds the Ph problem. Organic materials are lacking in the desert soil, which reduces the quality of the soil structure in general. 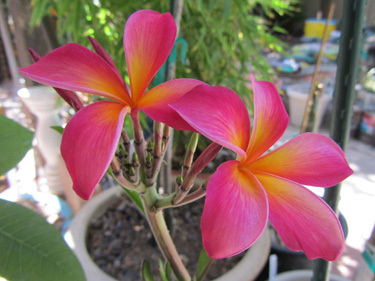 Since Plumeria's like a slightly acidic soil with a pH between 6.0 to 6.7, soil amendments are needed to help these plants thrive. Following is a list of soil amendments that can be added to soil to help solve these problems. Information on diagnosing what a plant needs can be found on the Vitamin and Nutrient Deficiency Symptoms in Plants page. Rather than debate which is better, which would take pages to do, I would rather convey my general philosophy. The approach I currently recommend could be called Chem-Organic. Generally, I like to start out with the basics, by only adding compost and water to see how a plant does. Newly planted plants shouldn't be fertilized anyway so this phase can last up to a couple of years depending on the type of plant you are growing. Many plants will do very well with just the basics and will never need anything else, while other plants will do better with some stronger organics or slow release fertilizer. Stronger organics are things such as fish emulsion, bone meal, apple cider vinegar and sea weed extracts. 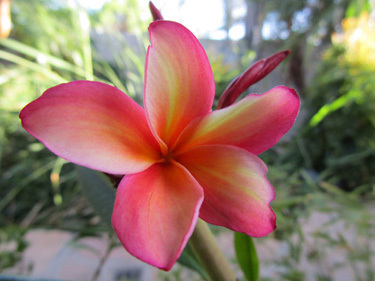 In the case of tropicals like Plumeria, a good organic compost should be mixed into the soil to help lower the soil's alkalinity. So, in general, strive for a minimal amendment environment, be patient and if you do decide to fertilize, do it in moderation. Compost is partially decomposed organic matter and is the most organic of the organics. I consider it my number one, best soil amendment. It can be purchased or made in one's yard out of old plant matter. Making your own generally isn't worth the trouble and you can still consider yourself environmentally friendly by donating your yard waste to the city. Many cities have special trash barrels for this purpose. Compost can be mixed into the soil and also be spread around the plant on the surface periodically over the long term. It will help prevent the growth of weeds and will make the pulling of weeds easier. It will also facilitate decomposition on the surface helping to enrich the soil. However, do not be too generous with the compost because it can cause some problems if overused. Too much compost spread on the surface can act as a water barrier, either keeping the plants soil soggy or preventing rain from penetrating because it acts like a sponge. Generally, an inch of compost on the surface is usually sufficient, and it should be allowed to decompose and thin out before the next application. The Phoenix area has a very dense clay soil which packs together tightly and becomes like soup when wet, preventing soil aeration. To help make the soil around a plant more permeable to air one can mix in several pounds of a large grained sand during planting. The typical construction sand you can get at your local big box store works well. The need to mix in sand depends on the type of plant, and how often it is watered. Plants that need improved aeration the most are the ones that prefer the soil to be constantly moist but are still sensitive to the soil being too soggy. When the soil is too wet for a plant it will typically get chlorotic, meaning its leaves will become an unhealthy yellow color. I have found that lychees, cherries of the rio grande and joboticaba plants benefit from having sand mixed into their backfill during planting. If the plant is already in the ground, a tool such a hammer drill with a large bit (1 inch plus) can be used to drill holes around the perimeter of the tree which can then be filled with sand. I did such a drill and fill operation around my, already planted, lychee tree and its health improved substantially. Perlite and Pumice are additional Inorganics that can be added to soil to help improve drainage and aeration. These are important soil additives for tropical plants since they aid in improving the overall soil structure. Since perlite and pumice granules are larger in size than sand they provide even more drainage and aeration than if you only use sand alone. 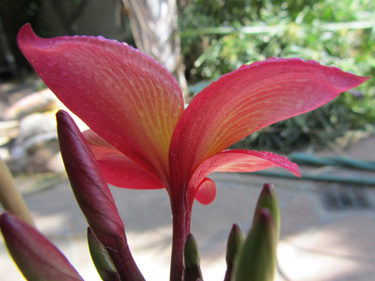 Plumeria need good drainage in order to survive and they cannot have wet feet or soggy soil or they will begin to rot. Water salinity is important to plants because it affects the ability of a plant's roots to take up water. Plants normally regulate how much water they have in their system by actively drinking through their roots. When the water surrounding a plant's roots becomes too salty, the salty water does not actually have a lot of water molecules within it, relative to the fresher water within the plant. Water, like all liquids seeks to evenly distribute itself. The scientific term for this is osmosis. This means that in the case of salty soil the lower concentration of water molecules outside of the roots draws water from the roots with such force that the plant is less able to take in water. The plant then starts to show signs of drought stress. Plant growth is first slowed, because the plant is using a large part of its energy trying to take in water. If these conditions continue, the plant will begin to conserve water by allowing its extremities to dry out, which will be first evident on its leaf tips, referred to as salt burn, followed by major branches, and so on. Salt burn is one of the number one problems the exotic plant gardener will have in Phoenix. If the problem is not treated, salt burn can often kill salt sensitive plants. Keep in mind that some fertilizers make the soil more salty, so it is often best to use them in moderation on your salt sensitive plants. The best way to minimize salt buildup around a plant is to periodically deep soak/leach the soil. Leaching is done by placing a hose in the basin and letting it flood slowly for many hours. This procedure can be done preventatively for salt sensitive plants 2 to 4 times a year. Sometimes, leaching with water alone, is all that is needed. If this is not effective enough, one can try leaching in combination with gypsum. A fascinating fact is that gypsum is also a salt. So how is it that adding gypsum can help to reduce the saltiness of a soil? The short answer to this question is that gypsum helps to wash away salts in sodic soil. When gypsum dissolves in water, calcium ions are released which displace sodium ions from their bonding sites in the soil. Unlike the sodium ions, the calcium ions open up the soil. A thorough soaking can now wash away excess salts, including any gypsum ions that did not find a bonding site. Interestingly, gypsum is not a harmful salt when thoroughly leached because it permits itself to be quickly washed away. Keep in mind that using too much gypsum will necessitate more leaching to wash it way so moderate amounts should be used. Nitrogen, phosphorus, potassium, and other nutrients can be added to the soil using standard chemical fertilizers. The strength and components of the fertilizer should be chosen to suit the plant it will be used on. Fertilizers containing sulfur will help to lower the soil Ph of the soil temporarily. It is best to go easy on the chemical fertilizers because it is very easy to burn a plant beyond the point of recovery. Furthermore, plants that dislike alkaline soils are more easily burned. Fertilizers take a long time to give results and can even take up to a month to burn a plant. So, patience is truly a virtue in this case. Many a gardener has killed a plant by fertilizing and then two weeks later fertilizing again because nothing seems to be happening. Slow release dry fertilizers can be a conservative alternative as well. In fact, I have become a very big fan of the Osmocote fertilizers for acid loving plants, because they reliably slowly release Nitrogen to the soil plus help reduce alkalinity.